Next generation nano-technology flowable composite offers enhanced esthetics, excellent physical properties and flow-on-demand handling. Low-viscosity, light-cured, radiopaque composite. 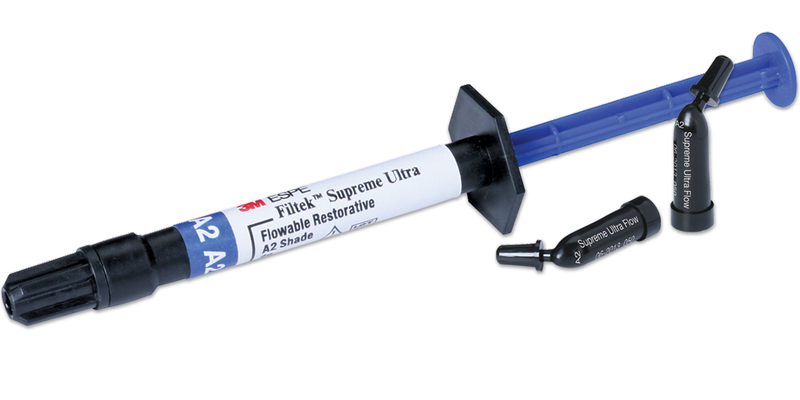 Filtek Supreme Ultra Flowable is indicated for the restoration of minimally invasive cavity preparations, as a base or liner under direct restorations, and to repair small defects in esthetic indirect restorations, pit and fissure sealants, block-out of undercuts, and resin and acrylic temporary materials. Shades match Filtek Supreme Ultra universal composite. Contains: 2 x 2g syringes and 20 dispensing tips. Contains: 20 x 0.2g capsules. Filtek Supreme Ultra Flowable earned 4.1 stars out of a possible 5.0. For single viscosity material, its consistency comes close to ideal for across-the-board usage, with minimal to no slumping but with flow when you want it to. Shades and color matching are above average and polish is excellent. Porosity is minimal. Doesn't quite hit the 80% cure goal at the bottom of a proximal box. There are no incisal shades, which may limit its use when repairing small incisal edge fractures. Working time is minimal. Too opaque in some cases. No organizer - bags are tough to store on shelf. While fluorescence is better than previous version, it still appears bluish compared to tooth structure. Probably the best overall single-viscosity material, but it could be even better if it had an incisal shade and it cured better in Class II.